Review By: James P. Bongarra, Jr. 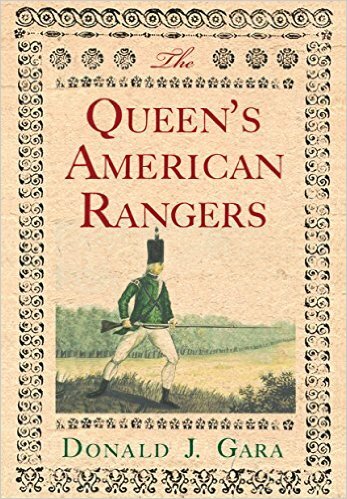 The Queen’s American Rangers tells the story of a Loyalist unit that fought in the American Revolution. The unit, named to honor Queen Charlotte, King George III’s wife, has a storied history, with a legacy continuing to this day in the U.S. Army’s elite Rangers. It was founded by a British hero of the French and Indian War, Major Robert Rogers, leader of the “Rogers’s Rangers” and known for his daring and unorthodox battle tactics. Rogers’s Rangers was disbanded in 1761, leaving Rogers without a position and deeply in debt. Thus begins Donald J. Gara’s book. Gara sets the stage for his book by describing Rogers’s dogged pursuit to reestablish himself. After numerous imprisonments and failed attempts to secure a permanent position with the British government, Rogers, unsure of his loyalties, offered his services to the Continental Congress and General George Washington. Suspicious of Rogers, Washington denied his request. In 1776, Rogers was granted a provincial commission as a lieutenant colonel in the British Army. Finally, after years of disappointment and rejection, Rogers had a military appointment and could raise troops for his new Rangers. The new Ranger unit was comprised of inexperienced rank-and-file and officers, primarily recruited from Staten Island, a haven for Loyalist refugees. In October 1776, the unit suffered its first defeat when its encampment was surprised by American troops. In early 1777, the Rangers experienced their first assignment of the war—patrolling Long Island during the Battle of Harlem Heights. This marked the beginning of the exploits of the Queen’s American Rangers that would continue until they were formally disbanded in 1783. Gara chronicles the development and campaigns of the Rangers throughout the Revolutionary War, including the relocation of its survivors, their families, and sympathizers to Canada after the Battle of Yorktown. Carefully sifting through numerous primary sources, Gara provides an historical overview of the war experienced through the actions of the Rangers. While the narrative’s main perspective is from a Loyalist unit of the British Army, Gara also provides insights into the strategies and struggles American forces experienced during the Battles of Monmouth Court House, Brandywine and Spencer’s Ordinary. Rogers’ command of the Queen’s American Rangers was brief, being relieved of his duties, 30 January 1777. Nonetheless, the Rangers continued to fight on under other commanders, all regular British officers. The most notable was Captain John Graves Simcoe, taking command in October 1777. By now the unit had seen action in numerous maneuvers in New Jersey and had distinguished itself at the Battle of Brandywine, resulting in official recognition from Major General William Howe, the commander of British forces in America. Simcoe was the last commander of the Queen’s Rangers, as they were subsequently identified; the title was likely bestowed because the unit was given exclusive privilege to enlist “old countrymen,” (i.e., European emigrants). He proved a most competent commander, further shaping the unit into a superior fighting force and, like Rogers, departing from traditional British tactics. Gara has compiled a substantial amount of detailed information into a readable and informative narrative. His inclusion of several anecdotes, including an incident prior to the Battle of Monmouth Court House when Simcoe convinced unsuspecting local rebel inhabitants that he was “Captain” Light Horse Harry Lee, add to the book’s appeal. The Queen’s American Rangers is a comprehensive synthesis of multiple primary sources, a work suited for the serious student of Revolutionary War history and military tactics.